It bulges now, from its dense stuffing of folders and clippings and tattered envelopes of photos. I haul it from one corner of the house to another, fully intending to organize it. Now the box lurks in my office again, holding two worlds of information and an Everest of potential effort. 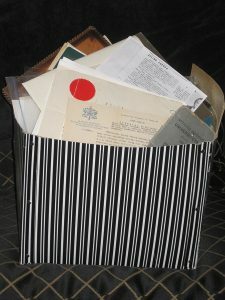 After Dad died, I found various documents from his past and Mom’s, neatly organized, as he was, in a small brown file folder meant for business envelopes. I of course expanded this into a binder of plastic pages protecting the crumbling immigration forms, with photos of them as students, DP’s and immigrants, certificates issued by clergy in Germany, name change forms. I was proud to have them all in one place, thought dishevelled after hunting for the documents I needed to apply for Lithuanian passports for my kids. The box also contains mementos – a tiny diary of my mother’s, written in the hospital in Toronto where I was born… and multiple scribbled notes about the family from random conversations (never in rational order), newspaper clippings and decrepit photo albums. Now it’s been 5 and 10 years respectively since Mother and Dad died. My sister and I often spoke about reconstructing our genealogy, and though she insisted I should write the spellbinding story of our family, we were both too busy with other interests and endeavours. I think the knell of mortality finally prods us to think about where we came from and what we leave behind. It’s really of little interest to the young. But on the other side of 50 or 60, some may begin to consider the long view. It helped to be encouraged by a cousin in Lithuania. During his visit to Canada in March of this year, we composed an email to be sent out to all our cousins on that side of the family to contribute their stories and photos to what would be the Family Photo Book, with bios and notes and a family tree. Once again, lack of time and motivation frayed my enthusiasm. Several months have elapsed since the email of intent… but EUREKA! I’ve had a brilliant idea. Who wants another book? A website is the answer! A very interesting first box. What advantages do you foresee by your children having Lithuanian passports? Are there not issues with obtaining dual citizenship? If one must choose only one passport doesn’t that make it more of a weighing of pros and cons rather than a simple “must have it”?